Hope you have a wonderful day... it would be lovely if you would hop over to the AJVD blog for a look and let me know what you think! Wishing everyone a very happy and blessed new year! Hello!! Hope everyone had a really wonderful Christmas! 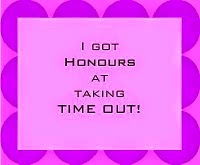 I know I did!! 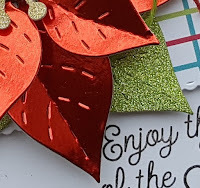 Stopping in today with my card for this month's PTI blog hop. Once, again, Nichole gave us a really lovely inspiration photo. I decided to use all of the bright pretty colors found in the photo. Because during this time of the year things can get a little bit hectic and time gets tight I decided to use one of my Make It Market Mini Color Pop kits since all the components needed to create a beautiful card are found within each kit. Originally I was going to use the Color Pop butterfly kit, but soon realized that the colors in the Color Pop Florals kit were a better fit. I used the die cuts that come with the kit along with one of the pre-made panels. I die cut the panel down a bit and then arranged all the flowers and then adhered them at different heights. The celebrate today die cut was cut three times, adhered together using spray adhesive, adhered to the panel and the panel to a white cardstock base. As a final touch I added some Nuvo Glitter Drops in White Blizzard to the centers of all the flowers. Can't wait to see how everyone else was inspired by the photo! Hello!!! Well... Christmas is just a couple of days away and my little guy is getting more and more excited!! He cannot wait for Sunday!! 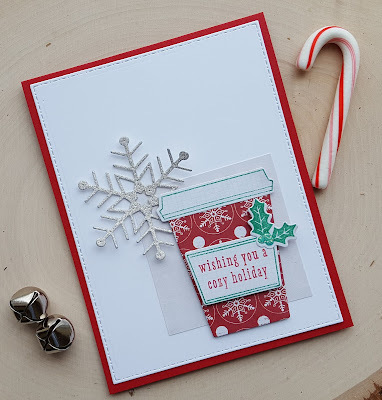 Like a lot of people I haven't been doing much crafting, but I am in need of a card that isn't a Christmas one to send to some so I used the current Freshly Made Sketches as well as the current Essentials by Ellen pin-sights challenge for my card. I recently picked up a few more Essentials by Ellen goodies thanks to Ellen's 40% sale that happened last weekend. One of the items was the Geo Tree die set. I used it to create a shaker element on my card. I'm pretty shaker challenge, but I bought these thin foam adhesive strips from Stampin Up! awhile ago and they have been very, very helpful!! I die cut the tree from some red patterned paper and then built my shaker element. I filled up the shaker portion with some sparkly clear sequins, red sequins and little white and silver seed beads. It looks really pretty in real life. 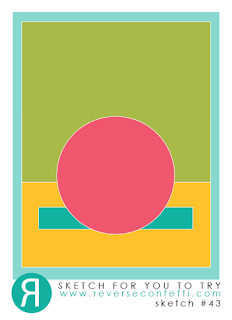 A strip of polka dot paper was adhered to my card base and then I adhered my shaker element. I finished off with a little strip of paper stamped with the sentiment (from AJVD). 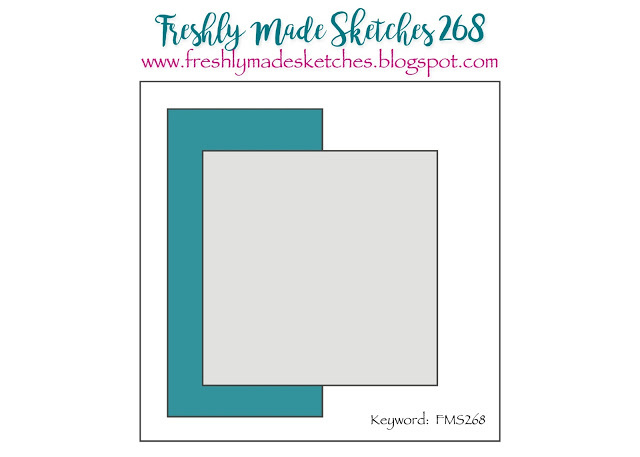 As you can see the FMS layout is a square one and I had planned on making my card square, but ended up using the usual A2 card layout! 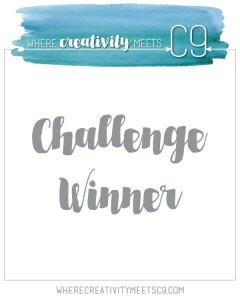 I'm going to add this to the current Simon Says Stamp Wednesday challenge of make it sparkle since there is lots of sparkle in my shaker element! Hello!! Is everyone ready for Christmas??!! Just a few more things for me to do, but in the meantime I'm popping in to let you know that I have a post up on the AJVD blog today. 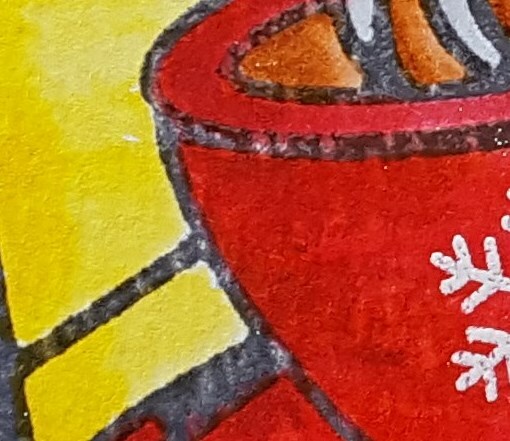 Here is a little peek of my project... nope it isn't a card! Wishing everyone a very Merry Christmas!! I hope you will take the time to head over to the AJVD blog for a little peek and to let me know what you think! Hello!! Stopping with a little birthday card I made for the current Essentials by Ellen Pin-Sights challenge, as well as Freshly Made Sketches. 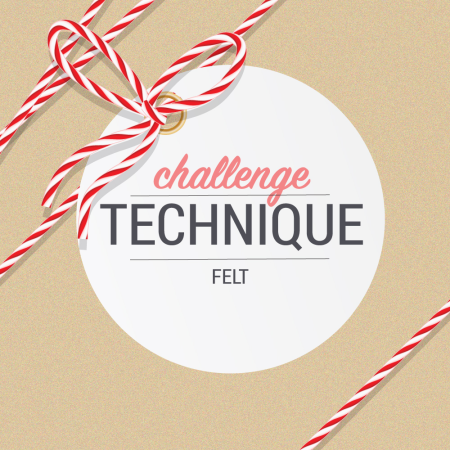 I just squeeking in for FMS... the challenge closes in just a few hours. I used the Essentials by Ellen Poinsettia and Pine dies and a sentiment from the EE Lovely stamp set. Since Christmas is almost here and I don't need any more Christmas cards I decided to make a winter birthday card. When I looked at the Pin-Sights inspiration board my eye was drawn to the wreath in the upper corner and so that is where I got my inspiration. I die cut the pine branch twine and then layered that on my white cardstock piece that I had stamped with the sentiment. 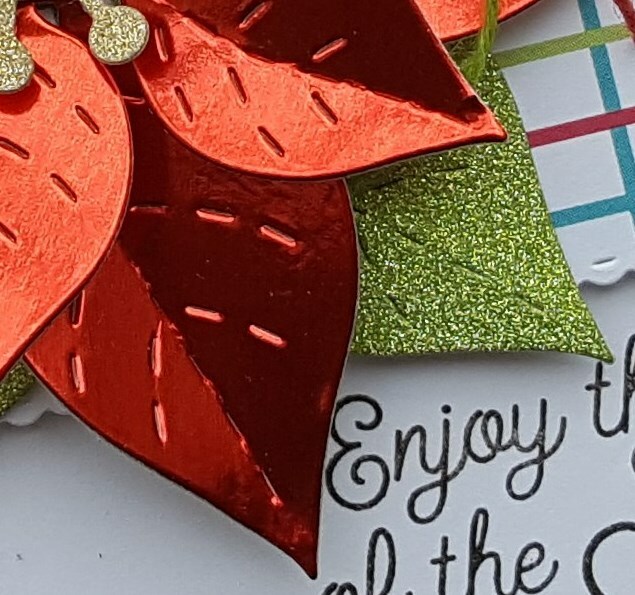 To bring in more red I added a strip of red cardstock at the bottom and some the red die cut berries. 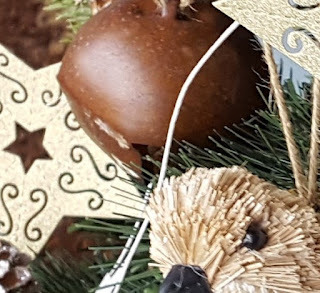 The pinecone was actually die cut three times because the cardstock I was using was rather thin and then adhered together using spray adhesive. 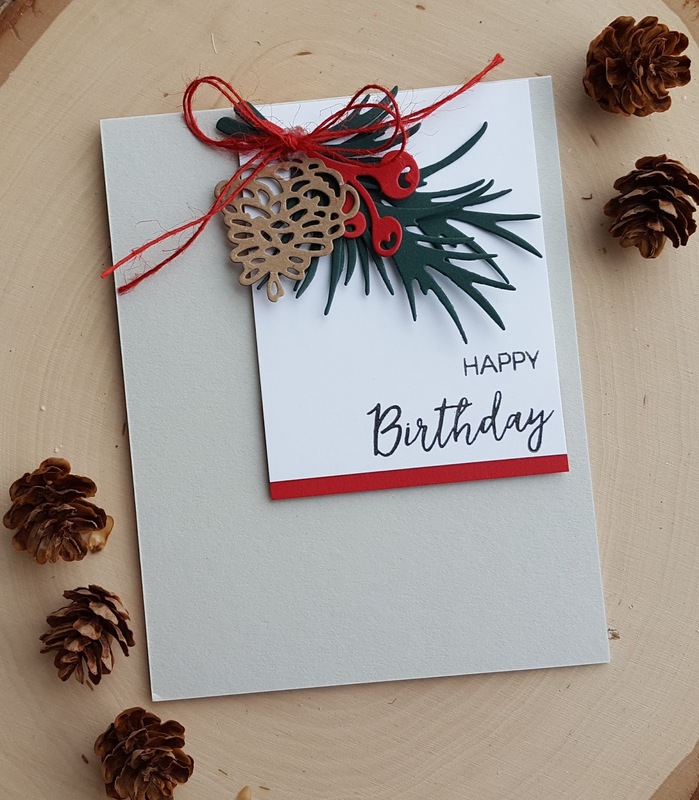 After adhering the panel to my card base I added the berries, the pinecone and the red twine bow to finish things off. Even though I added the bow I think this would work perfectly for a guy. Hello... another cold day here in the PNW! I managed to complete one last tag for the 12 Tags of Christmas with a Feminine Twist. 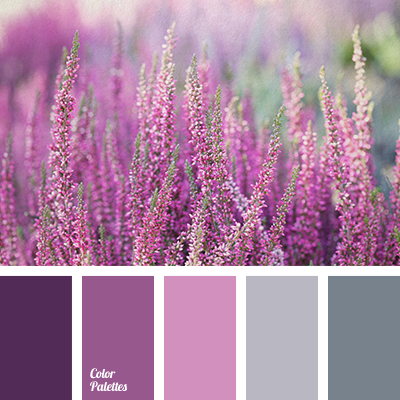 This is for day 6 to use purple and gray. The tags that Lisa and Jill created are absolutely gorgeous! 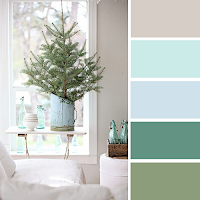 Both tags used a mix of the colors and that is where I took my inspiration from. At the start of the Thanksgiving/Christmas season my local grocery store always has some of those "painted poinsettias". 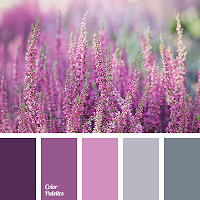 Most frequently the colors are purple and teal and that is what I thought of as I came up with an idea for my card. 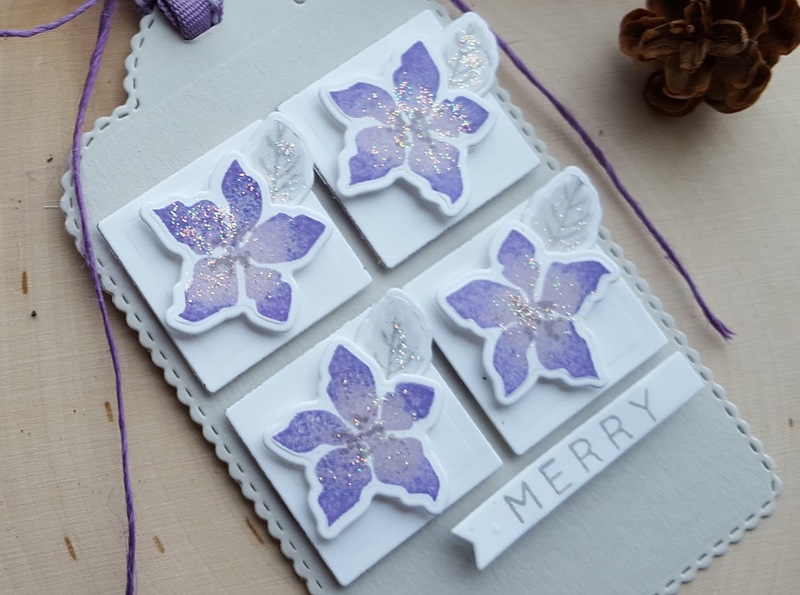 I used MFT's Mini Modern Blooms stamps and dies as one of the flowers in the set looks a lot like a poinsettia. I inked up the flower in two different shades of purple, stamped and then die cut them. I added the centers using a medium shade of gray. The leaves were stamped in a light gray ink, the veins added with the medium shade and then die cut. I used a small Spellbinders square die to die cut the squares. The tag was die cut from a light gray cardstock and then the squares and flowers were adhered. I die cut a small MFT fishtail flag, stamped the sentiment (from a SSS stamp set) and then adhered that to the tag. Some Diamond Stickles was brushed on to the flowers to give them that glittery look that the painted poinsettias have on them. 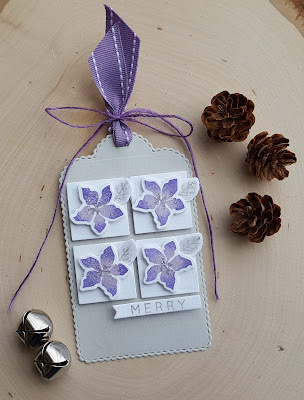 Finished off the tag with purple ribbon and twine. 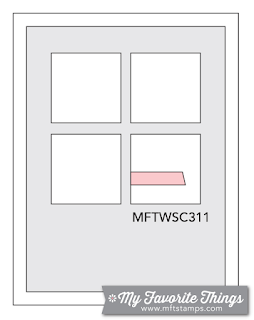 The layout for my tag is based on the current MFT Wednesday challenge so I will be adding my tag to that gallery as well. I have included a close up of the flowers. Hope you have a wonderful day... and stay warm!! hey!! popping in on this sunny, but cold day here in the PNW with another tag for the 12 Tags of Christmas with a Feminine Twist. I have lost count of how many tags I have made, but this one is for day 5. Julie and Brandi created some amazing tags and challenged us to create something icy or frozen. 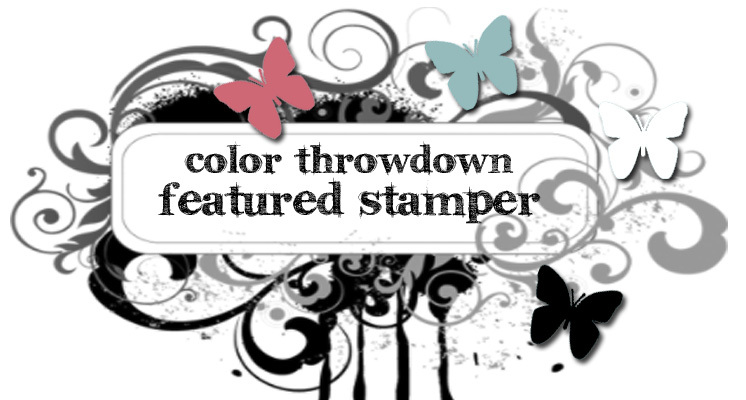 I was totally inspired by Brandi's beautiful tag to create my tag. I used the Essentials by Ellen Season of Sparkle and Brushstroke Christmas stamp sets along with the Essentials by Ellen Brushstroke Joy die. The layout for my tag is based on the current CAS(E) this Sketch so I will be adding my little tag to their line up. I started by stamping snowflakes from Season of Sparkle on white cardstock using VersaMark ink. I applied iridescent embossing powder and heat set. Once that was done I die cut the tag from the cardstock and applied Distress ink in Iced Spruce and Evergreen Bough to my tag fading it out at the bottom. 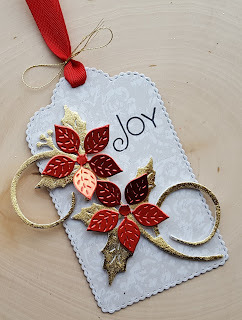 Joy was die cut from white cardstock three times, adhered together and then adhered to the tag. I then covered the word with lots and lots of sparkly Ice Stickles in Diamond to give the tag an even icier look. I stamped the sentiment (from Brushstroke Christmas in black and then trimmed it out. Once the Stickles had dried I attached the sentiment and then added the ribbon and trim. 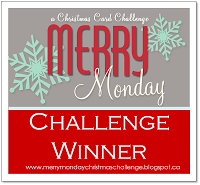 I think I will also be adding this to Lori's Visions of Sugarplums challenge which closes soon. Hello!!! Popping in with another tag... 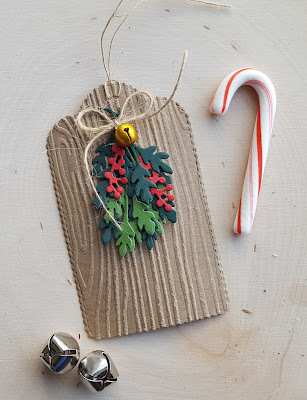 I know I said I wasn't much of a tag maker, but I am seriously enjoying making them right now! 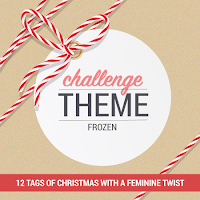 This one is for day 7 of the 12 Tags of Christmas with a Feminine Twist. 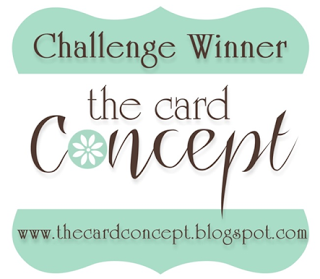 That challenge was a sketch and the cards that Heather and Melania made are just beautiful. I was inspired by Melania's take on the sketch I used some striped patterned paper from My Mind's Eye (On Trend 2). The stamps and dies are from Verve. I die cut the tag and then stamped the sentiment in the lower corner. The little stockings were die cut from some paper from the same pad and then stamped with the corresponding images. I added Diamond Stickles to the tops of the stocking and some Nuvo Crystal Drops in Pale Gold to the little balls that decorated the tops. Once they were dry I attached them to the tag, looped the light pink twine through the hole along with the pompom trim and I was done. I also used the inspiration photo for this month's Diva Inspiration hop for my tag so I will be adding it to the line up there, as well. With this tag I have now completed 8 of the challenges. I hope to get a couple more tags completed before the challenge closes on the 17th! 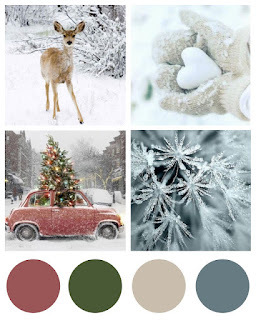 Hope you have a wonderful day and that you will take some time to head over to the AJVD blog for a look and to let me know what you think! Hey!!! Stopping in to share another tag for the 12 Tags of Christmas with a Feminine Twist. I have now made seven tags total!! This one is for day 12 which is a color challenge to use blue, green, teal and tan. The tags that day 12 designers Carolyn and Angie are super cute and I took inspiration from both tags in creating mine. I had recently gotten the Concord & 9th Cozy Up stamps and matching dies and had been itching to make something with them. I decided to pair them up with the day 12 challenge. I die cut my tag and then stamped the tag with the heart image from Cozy Up using tan colored ink. The little coffee mugs were stamped on watercolor paper with VersaFine Smoky Gray ink and then colored with ZIG markers in blue and green. The little steam curls were die cut from watercolor paper and then colored with a gray ZIG. To finish the mugs off I stamped the little snowflake using VersaMark, applied white embossing powder and then heat set. 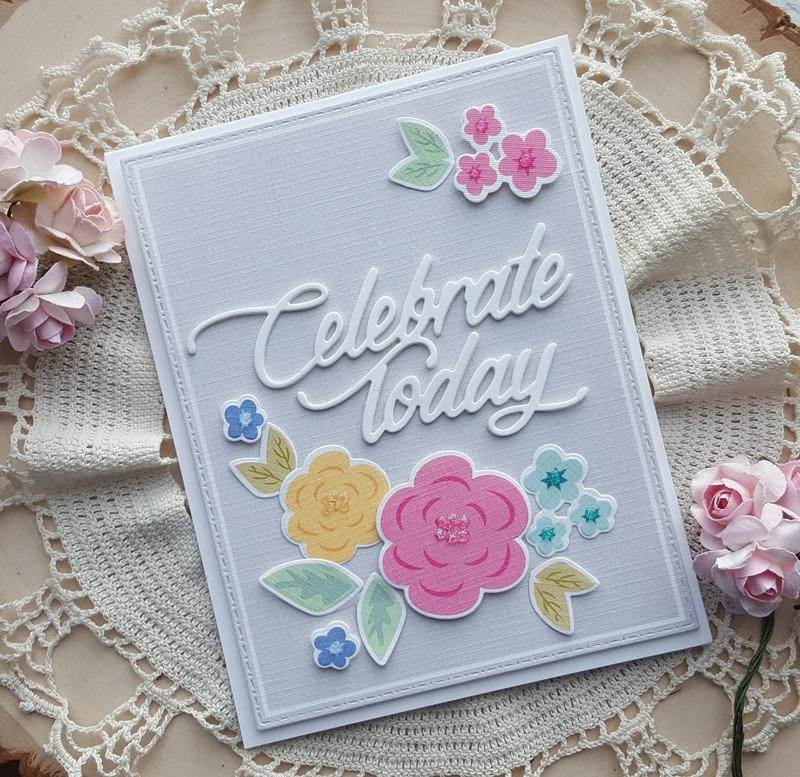 The sentiment is from the C9 Shine Bright stamp set. It was stamped in VersaMark on kraft cardstock, white embossing powder applied, heat set and then trimmed out. I arranged everything on the tag added the teal colored twine and I was done. 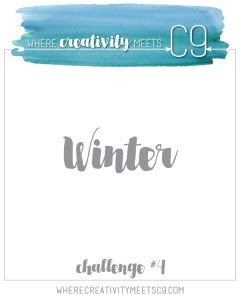 I'm also going to add this to the current Where Creativity Meets C9 challenge of winter. 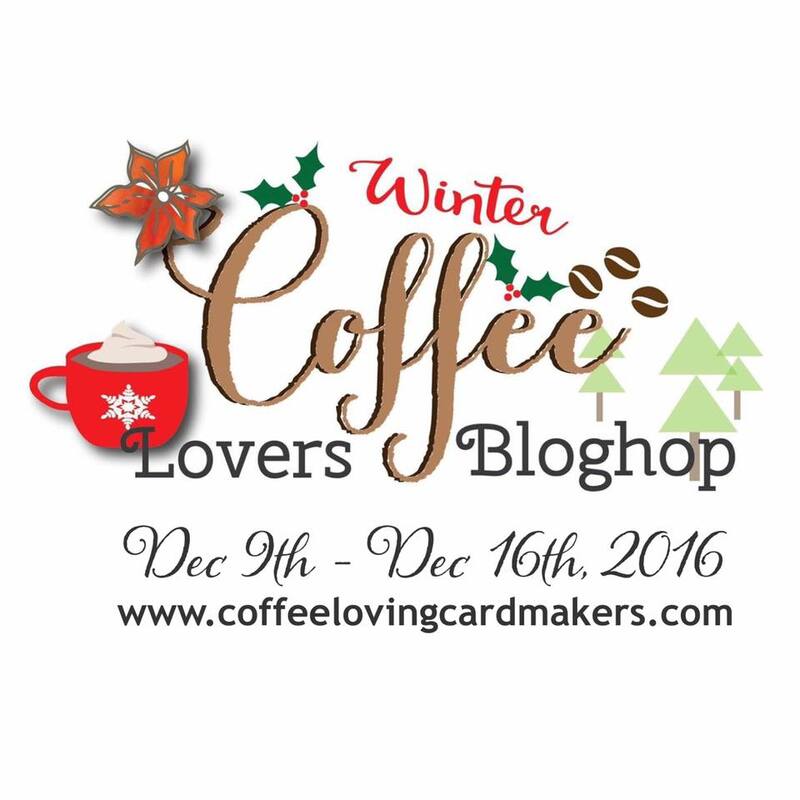 Since I have little coffee mugs on my tag I'm going to add it to the Coffee Lovers winter blog hop. Hello!! 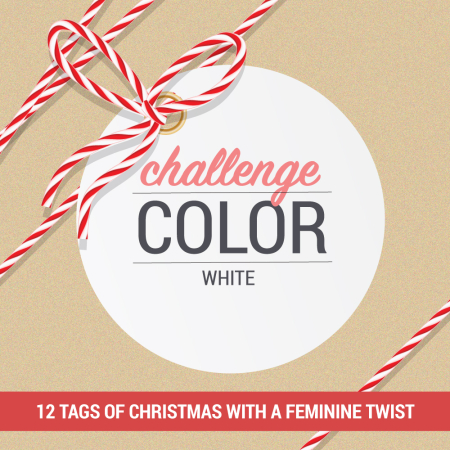 Stopping in with two more tags for the 12 Tags of Christmas with a Feminine Twist. With these two I'm posting today I have made 6 tags. I'm working on number 7 and will try to get a few more done before the 17th. First up is a tag for the day 11 challenge to make a country Christmas inspired tag. If you have not checked out Kittie's tag you absolutely must... you will be blown away!! I do not think there is anyone out there who works with die cuts as well as she does... she is amazing!! As I thought about what I wanted to do I knew I didn't want to do a wreath, but couldn't think of anything else until I made a little trip one of my favorite garden centers, Watsons in Puyallup, Washington. As I walked into Watsons I saw these beautiful swags hanging up outside and when I saw them I knew just what I would do! I die cut the branch die from the Hero Arts October My Monthly Hero kit from dark green and light green cardstocks. I cut each branch apart and then layered the pieces together. I then grabbed a little gold bell, threaded some twine through it and tied a little bow. The tag was die cut and then run through my Big Shot in a woodgrain embossing folder. I then adhered my little swag, added the bell and bow, some additional twine and I was done. My second tag is for the day 9 challenge to use white along with silver and gold. The tags that Sharon and Jean made for the challenge are just gorgeous!! 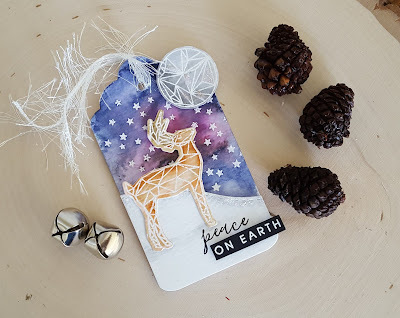 I was definitely inspired by Sharon's beautiful tag when I created mine! I went very simple with my design which is based on the current My Favorite Things Wednesday sketch challenge so I will be posting my little tag there. 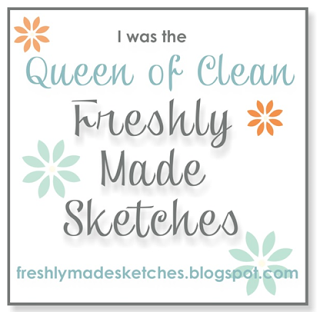 I have been challenging myself to use sketches and such for my tags. It is fun and interesting to figure out how to scale things down so you can still see the sketch, but make it work for a tag! I started by die cutting my main tag using a rectangle die and then added the tiny scallop along the edge. That was die cut using one of the dies from the MFT Stitched Mini Scallop Rectangles. 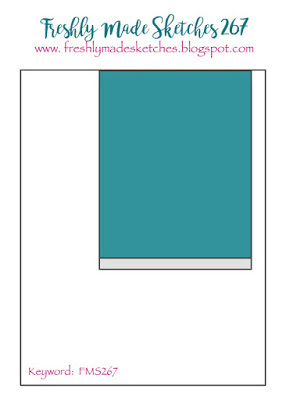 A smaller stitched mini scallope rectangle was die cut for another element of the design. 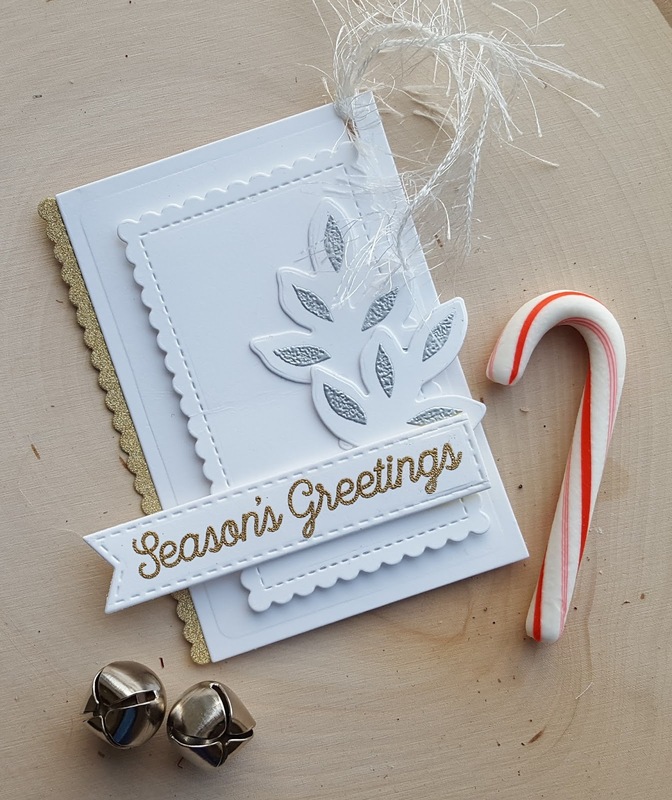 The leaves were die cut from white cardstock using the die from the Flashy Floral set. I then stamped each die cut with the partial image that matches using VersaMark ink. Silver embossing powder was applied and heat set. 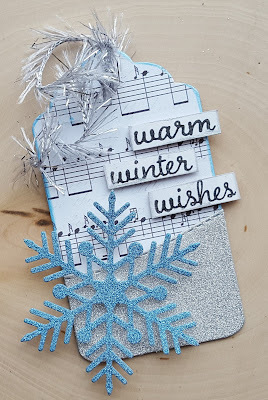 The sentiment is from the MFT Snowflake Sparkle card kit. I die cut a stitched fishtail flag stax, stamped it with the sentiment using VersaMark ink, applied gold embossing powder and then heat set it. Layered everything up, added some sparkly twine and I was done. 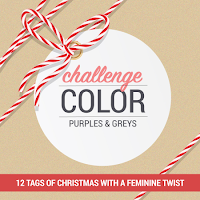 Stopping in with another tag for Ellen's 12 Tags of Christmas with a Feminine Twist. This tag is for day 8 where we are asked to use a watercolor technique. I took my inspiration from Carly's cute tag. 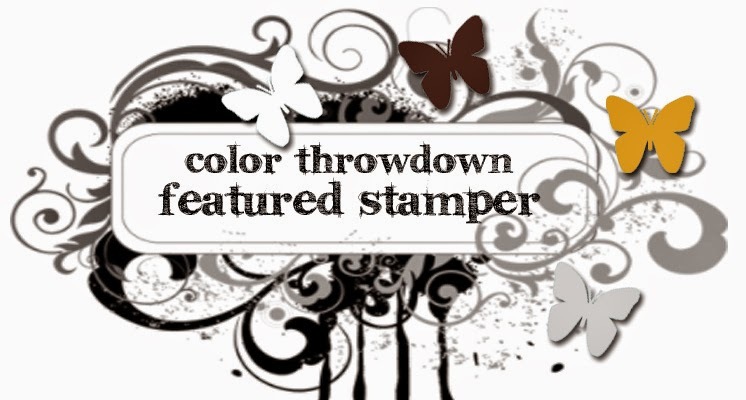 I'm also going to add this to the current Simon Says Stamp challenge of ice inspired, as well as Lori's Visions of Sugarplums challenge. At the beginning of the week Ellen offered the opportunity to by Christmas products at 30% off. I took advantage of that offer and purchased the beautiful Essentials by Ellen Season to Sparkle stamps and matching dies with the idea to use them specifically for my tag. I didn't use the color combo from the SSS challenge, but took my inspiration from the photos. I stamped the stag on some watercolor paper using VersaMark ink, applied iridescent sparkle embossing powder and heat set. Then I colored him with ZIG markers in two shades of brown and clean water. I let him dry and then die cut my tag from watercolor paper, stamped it with the stars from the same set using the same embossing powder and then watercolored my sky with a gray and dark blue ZIG. I added in some pink and orange to give it that Milky Way look. 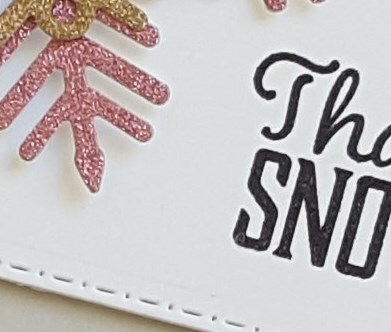 The little snowy slope was created by die cutting a second tag in half with a die from AJVD, applying some light gray ZIG and blending it out. Once everything was dry stamped the word peace in Onyx Black VersaFine (from the Season to Sparkle set) and then stamped "on earth" in VersaMark on black cardstock, applied white embossing powder, heat set it and trimmed it out. I adhered the slope to my tag and then added the deer and the rest of the sentiment. I decided to stamp the circle image from the set to create a little moon for the deer to be looking at. That was also embossed with the iridescent embossing powder and then colored with two shades of gray ZIG markers. To finish off the tag I added some more sparkle with Diamond Stickles and some the fringy, sparkly twine. Hello!!! As many of you know the Coffee Lovers Winter blog hop starts today and I have a card that I made for the hop using Hero Arts Coffee Cups Tags and the matching dies. 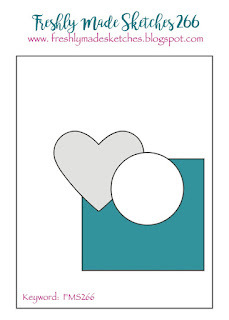 The layout for the card is based on the current Freshly Made Sketches layout. This card is going to the gals who work at the Starbucks that I frequent so I went with a Starbucks Christmas inspired design. 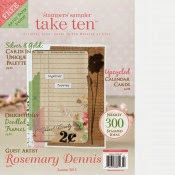 The papers used are from the Teresa Collins Santa's List 6x6 pad. I die cut the cup from the snowflake patterned paper and then the lid and the wrap from another piece from the pad and then stamped them with the matching images using green ink. The little bit of holly was stamped in the same green and then die cut with the matching die. 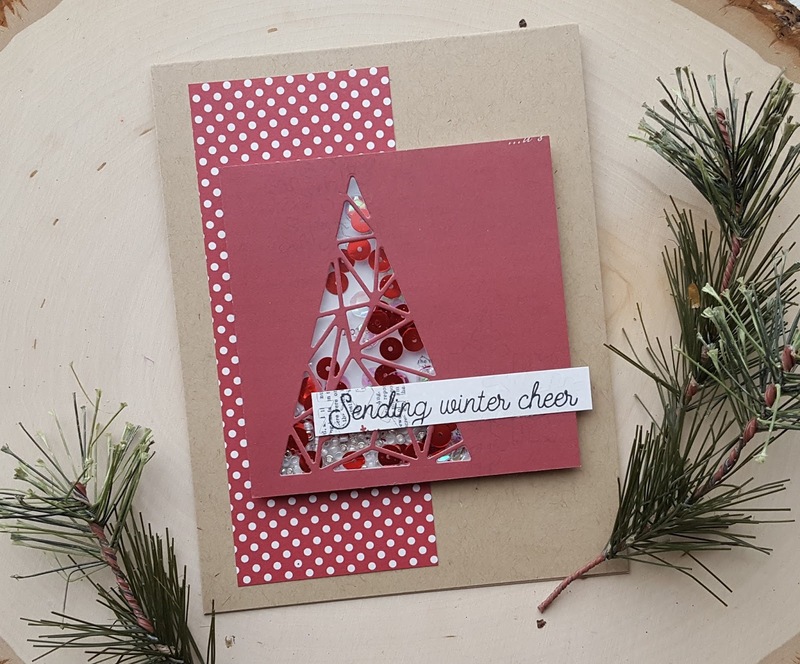 The sentiment was stamped in a red ink that matched the snowflake paper. 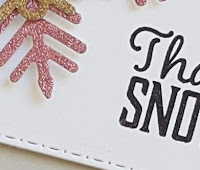 The snowflake (from A Jillian Vance Design) was die cut from silver glitter cardstock because well... glitter makes everything better, right??? 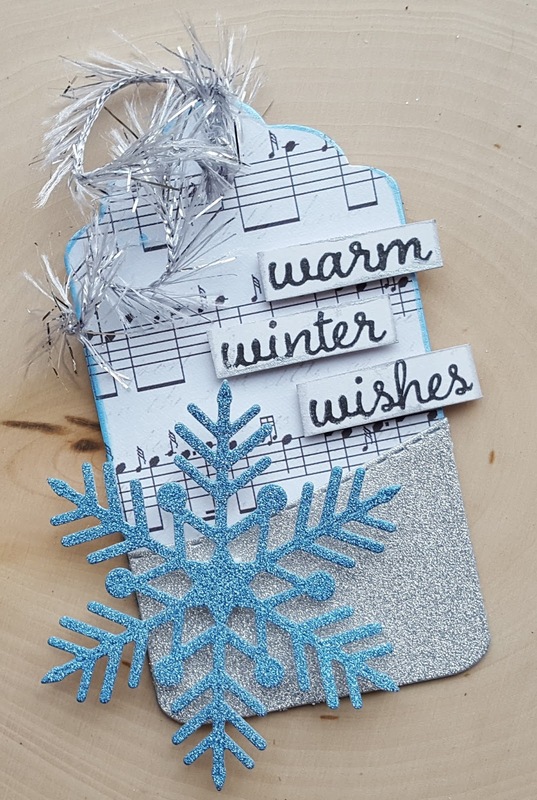 I was delighted to see that the die cut snowflake matches the little snowflakes in the pattern perfectly!! Another piece of paper from the same pad was trimmed into a square and then everything layered up as you see on a white cardstock panel. Since I'm not a coffee drinker my little cup is full to the brim with a yummy Starbucks Chai Latte made with soy milk! With my icy looking snowflake I'm going to add this to the current Simon Says Stamp Wednesday challenge of Ice Inspired and to Lori's Visions of Sugarplums challenge. Hello!! Stopping in with another tag for Ellen's 12 Tags of Christmas with a Feminine Twist. This tag is for day 4 where Jennifer and Clare showed us many fun ways to use felt on our tags. 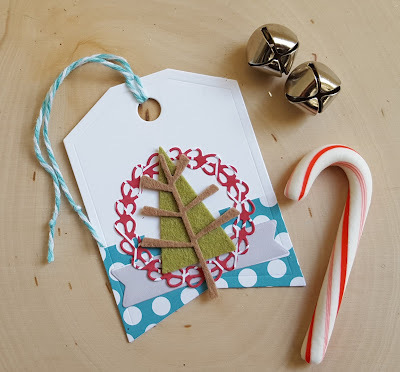 I was inspired by the way Jennifer used several different colors of felt on her tags. I used the December Sketch for You to Try layout for my tag so I will be posting it there, as well. Several different Reverse Confetti products used for this tiny version of the sketch! 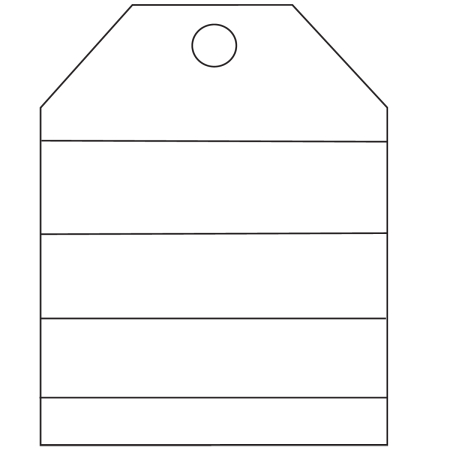 I started by die cutting the large tag from the RC Tag Me die set from white cardstock. 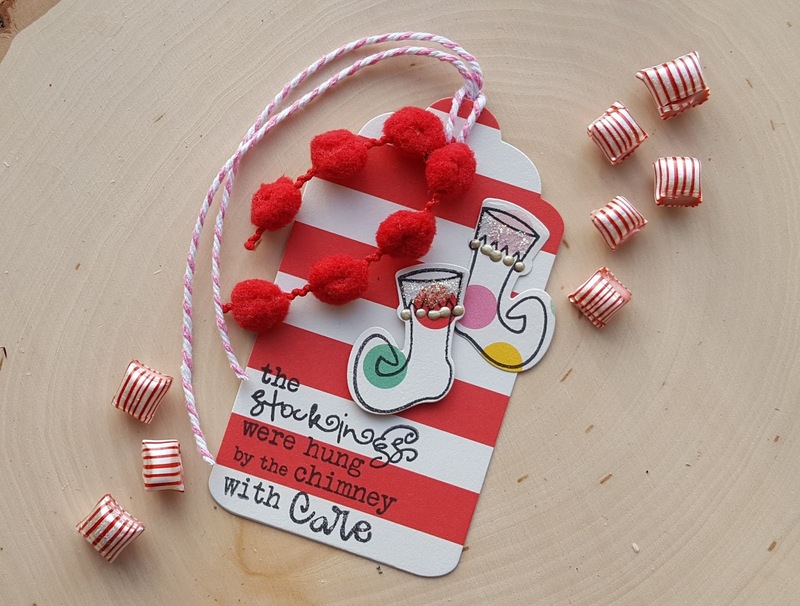 The polka dot paper is also Reverse Confetti (Very Merry)and was die cut using the bottom half of the same die and then adhered to the tag. I used additional papers from the pad to die cut the RC wreath and the little banner (a Simon Says Stamp die). The banner and wreath were then adhered to the tag. The little RC tree and trunk were die cut from green and brown felt, adhered together and then adhered to the tag. I finished my little tag off with some baker's twine that matched the polka dot paper. I just love how my mini version of the sketch turned out!! Going to add this to Lori's Visions of Sugarplums challenge. Hope you have a wonderful day... thanks for taking the time to check out my project and to let me know what you think... I really appreciate it! Hello!! 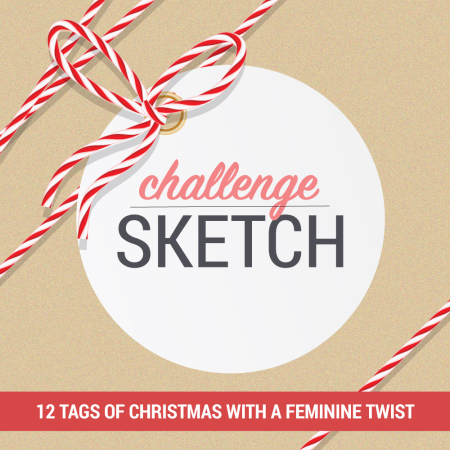 Stopping in with a couple of tags that I made for Ellen Hutson's 12 Tags of Christmas with a feminine twist. I am not a huge maker of tags, but all of the tags that have been showcased on the CLASSroom blog really inspired me to make a few. 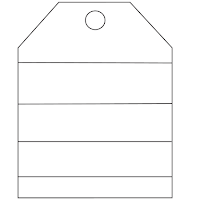 I made tags using ideas from days two and three. Day two was all about sparkle and using glitter and Julia and Kay provided some amazing inspiration. 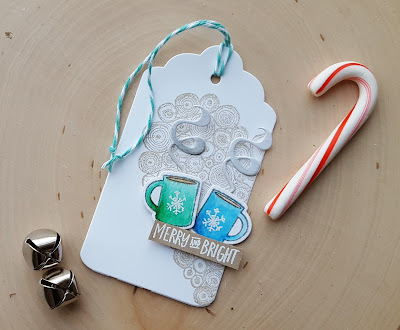 I was definitely inspired by Julia's gorgeous tag and I was going to use a die cut covered with glitter, but both of my tries turned out badly so I decided to switch to using glitter cardstock. Hopefully that is okay. I die cut the tag from some thin chipboard and then covered it with some paper die cut with the same tag. A tag was die cut from silver cardstock and then the bottom half was die cut using a stitched border die from A Jillian Vance Design. I edged the tag with some Brilliance light blue ink and then I adhered the silver glitter cardstock. 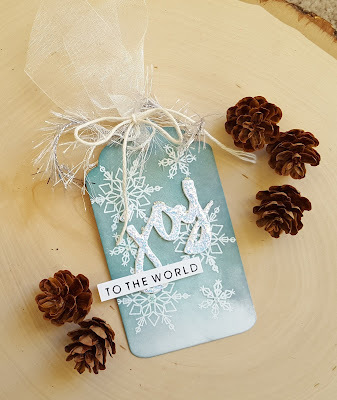 A snowflake (from AJVD) was die cut from blue glitter cardstock and adhered to the tag. 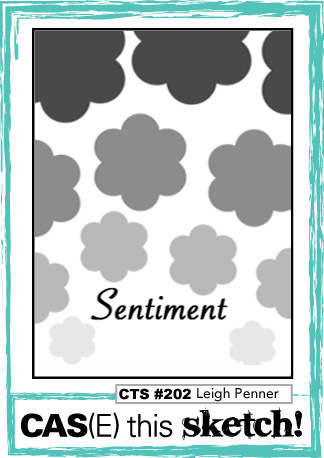 The sentiment (from A Jillian Vance Design) was stamped and then trimmed out. Each piece was edged with silver ink and then adhered to the tag. Finished things off with some silver tinsel trim. 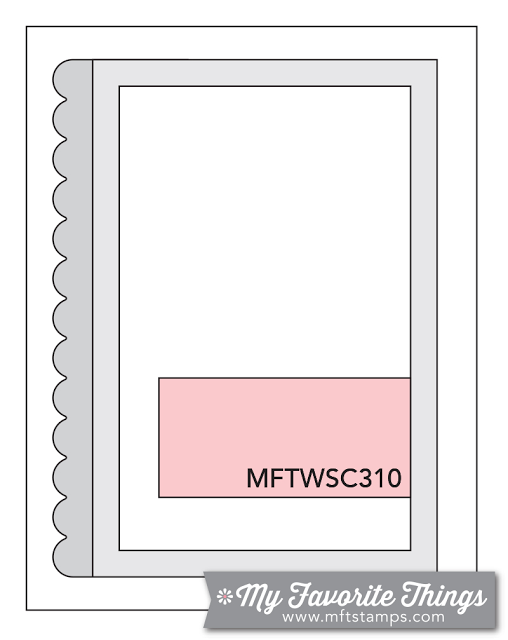 The second tag is uses the day 3 technique to use foiling. The inspiration tags provided my Carissa and Joni are just gorgeous! 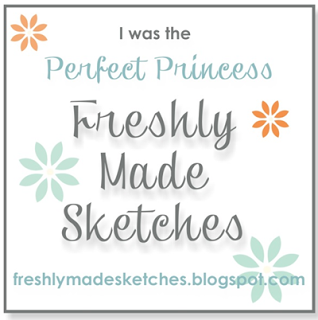 I took my inspiration for this tag from Joni's beautiful design. I die cut the holly swirl from AJVD from sticky back fun foam, the backing removed and then gold foil applied. I then die cut some small poinsettias (from AJVD) from red foiled cardstock. The tag (from AJVD) was die cut from thin chipboard and then covered with some patterned paper die cut with the same tag die. 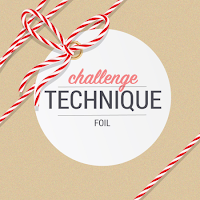 The foil covered holly swirl was adhered to the tag and then the little poinsettias added. Finished with the sentiment (from AJVD) and some thin red ribbon and gold thread tied in a bow. I really, really, really like how both tags turned out! I'm also going to add these to Lori's Vision of Sugarplums challenge. 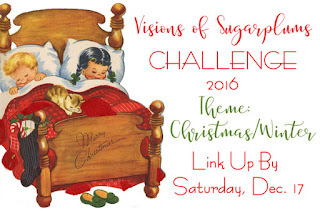 Lori is doing her annual Visions of Sugarplums showcase. If you have checked it out, you really should. 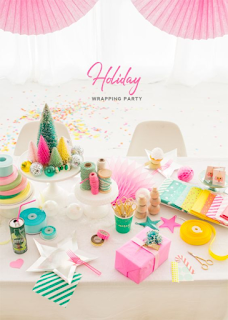 She has lots of fun prizes and a long list of talented guests including my friend Greta!